Information on how to enter, mechanics of entry and prizes form part of these Conditions of Entry. Entry into the promotion is deemed acceptance of these Conditions of Entry. Entry is in accordance with condition 12 of these Conditions of Entry, and is via satisfying all 3 Entry requirements (as outlined in condition 12) only. 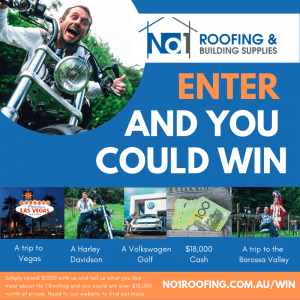 Entry is only open to No.1 Roofing & Building Supplies Account customers who are residents of the state of NSW, Australia aged 18 years or older (Entrants). The directors, management and employees (and their immediate families) of the Promoter, its related entities, printers, suppliers, providers and agencies whom are directly associated with the conduct of this promotion are ineligible to enter the promotion. Immediate family means any of the following: spouse, ex-spouse, de-facto spouse, child or step-child (whether natural or by adoption), parent, step-parent, grandparent, step-grandparent, uncle, aunt, niece, nephew, brother, sister, step-brother, step-sister or 1st cousin. The promotion commences at 12:00am (AEST) on 1/04/2019 and ends at 11:59pm (AEST) on 30/6/2019 (Promotional Period). By entering the promotion and submitting an Entry in accordance with these Conditions of Entry, Entrants will be entered into and granted four (4) separate opportunities to win prizes as follows: three (3) Minor Prizes and a Major Prize. For the purpose of determining minor prize winners and awarding prizes, the Promotional Period will be divided into Promotional Stages, commencing and closing on the dates and times (AEST) set out in the tables below (each a Promotional Stage, as applicable). In order to determine Promotional Stage winners, Minor Promotional prize awards will be determined by the selection committee at 1 Roofing & Building Supplies, 1 Warraba Rd, North Narrabeen 2101 on the date and time (AEST) set out below (each, a Prize Winner Decision). The Promoter may decide on five (5) additional reserve Entries in each Prize Winner Decision and record them (in order) in case an invalid Entry or ineligible Entrant is the Prize Winner or the Entrant is ineligible to accept or declines to participate in the prize. Each Entrant whose Entry is decided as the winner by the Promoter must confirm their eligibility to be awarded the prize and their ability to accept the prize within 14 business days of being successfully notified by the Promoter that their Entry has been selected, otherwise their Entry will be deemed invalid. In the event of an invalid Entry or an ineligible Entrant, or if the Entrant is ineligible to accept or declines to participate in the prize, the prize will be awarded to the first reserve Entrant. If the prize cannot be awarded to the first reserve Entrant, the Promoter will continue this process until the prize is awarded. If after this process a prize has still not been awarded, or if an Entrant cannot be notified, the Promoter will hold an unclaimed prize in accordance with Condition 28. In this promotion, each of the products listed in Column 1 of the table below (Eligible Product Table), when purchased during the Promotional Period is an eligible product (Eligible Product). The Eligible Product entitles the Entrant, subject to these Conditions of Entry, to the number of Entries listed in Column 2 of the Eligible Product Table, for the corresponding Weekly or Promotional Stage, Major Prize Winner Decision and Runner-up Prize Winner Decision. Selection of Eligible Products is subject to availability. Eligible Products may not be available for sale at all times during the Promotional Period. The Promoter accepts no responsibility for any Eligible Products being unavailable during the Promotional Period. Each Eligible Purchase of an Eligible Product entitles the Entrant to the corresponding number of Entries listed in the Eligible Product Table. Multiple entries are permitted. Each Entry, or group of Entries as listed in Column 2 of the Eligible Product Table must be based on a separate Eligible Purchase, must be submitted separately and must independently comply with these Conditions of Entry. For the avoidance of doubt, purchases of Eligible Products in separate transactions cannot be combined to form an Eligible Purchase. Each Entrant must retain and may be required to present proof of purchase of each Eligible Purchase in order to claim a prize. An Entrant may be required to provide to the Promoter proof of purchase for all Entries made, upon request by the Promoter. If an Entrant is unable to provide proof of purchase for all Entries made within the required timeframes, then all the Entries of that Entrant will be ineligible and deemed invalid. Proof of purchase includes showing the original and providing a copy of the Purchase Receipt for each Eligible Purchase made during the Promotional Period. Purchase receipts must clearly specify where the Eligible Purchase was made, when payment was submitted for the purchase, and that the Eligible Purchase was made during the Promotional Period but prior to entry. Minor Prizes: The one (1) eligible Entry selected by the Selection Committee as the most unique and compelling answer, from all entries received during the corresponding Promotional Stage will win one (1) Apple iPhone XR 64GB valued at AUD$1,229RRP. If, at the end of a Promotional Stage, there are any Minor Prizes that have not been awarded, the Promoter will hold an unclaimed prize Prize Winner Decision in accordance with Condition 28. There are a total of three (3) Minor Prizes to be awarded in the promotion. Major Prize Winner Decision: The one (1) eligible Entry selected by the Selection Committee as the most unique and compelling answer, from all entries received during the corresponding Promotional Stages will be the winner of the Major Prize, and this will take place at 11:00am (AEST) on Tuesday 6th August 2019 11am at No.1 Roofing & Building Supplies, 1 Warraba Rd, North Narrabeen 2101. The winner will be notified by telephone and in writing within two (2) days of the Prize Winner Decision. The winners’ name will be published on the Promoter’s website at https://www.no1roofing.com.au on Thursday 8th June 2019. All reasonable steps to notify the winner of the Major Prize Decision will be taken by the Promoter. The Promoter’s decision is final and no correspondence will be entered into. One (1) Trip to Las Vegas to the value of AUD$18,000. The AUD$18,000 will be awarded to the Major Prize winner by electronic funds transfer to a bank account nominated by the winner in writing within twenty-eight (28) days of the Major Prize Prize Winner Decision, to be used by the winner to pay for any travel costs associated with a trip to Las Vegas. The winner will not need to provide the Promoter with details of the travel details or costs. Bank account details will be requested from the winner after the winner is notified that they have won the Major Prize. One (1) South Australian Winery Tour to the value of AUD$18,000. The AUD$18,000 will be awarded to the Major Prize winner by electronic funds transfer to a bank account nominated by the winner in writing within twenty-eight (28) days of the Major Prize Prize Winner Decision, to be used by the winner to pay for any travel costs associated with the South Australian Winery Tour. The winner will not need to provide the Promoter with details of the travel details or costs. Bank account details will be requested from the winner after the winner is notified that they have won the Major Prize. One (1) AUD$18,000 cash prize awarded to the Major Prize winner by electronic funds transfer to a bank account nominated by the winner in writing within twenty-eight (28) days of the Major Prize Prize Winner Decision. Bank account details will be requested from the winner after the winner is notified that they have won the Major Prize. The Promoter may select five (5) additional reserve Entries in the Major Prize Winner Decision and record them (in order) in case an invalid Entry or ineligible Entrant is the Prize Winner or the Entrant is ineligible to accept or declines to participate in the prize. Each Entrant whose Entry is selected by the Promoter must confirm their eligibility to be awarded the prize and their ability to accept the prize within 14 business days of being successfully notified by the Promoter that their Entry has been selected, otherwise their Entry will be deemed invalid. In the event of an invalid Entry or an ineligible Entrant, or if the Entrant is ineligible to accept or declines to participate in the prize, the prize will be awarded to the first reserve Entrant. If the prize cannot be awarded to the first reserve Entrant, the Promoter will continue this process until the prize is awarded. If after this process a prize has still not been awarded, or if a Prize Winner cannot be notified, the Promoter will hold an unclaimed prize Decision in accordance with Condition 28. The total maximum prize pool is $30,000. The prizes are not transferable or exchangeable and cannot be taken as cash. The prizes must be taken as offered and cannot be varied. The prizes cannot be used or redeemed in conjunction with any other offer. The Promoter accepts no responsibility for any tax implications that may arise from prize winnings. Independent financial advice should be sought. The Promoter accepts no responsibility for any variation in prize value. All prize values are the recommended retail price including GST. The Major Prize if the motor cycle or motor vehicle is selected, does not include twelve (12) months registration, twelve (12) months third party compulsory insurance, on road costs, stamp duty, dealer delivery costs, comprehensive insurance and operational costs, which are the responsibility of a winner. All ancillary costs or accessories not expressly provided are the responsibility of a winner. To be eligible to claim the Major Prize of the motor cycle or motor vehicle, a winner must be capable of obtaining motor cycle or motor vehicle registration in his or her name and a licence to use the motor cycle or motor vehicle in accordance with the applicable legislation where the vehicle is collected. If a winner is, through any legal incapacity or otherwise, unable to register the motor cycle or motor vehicle in his or her name or lawfully use the vehicle, then a winner may, at their own cost, assign the motor vehicle to another person who holds the required licence and has the legal capacity to obtain registration. It is a condition of being awarded the prize that a winner must, following notification and prior to the awarding of the prize, confirm their full name and address, and provide the Promoter with a copy of their current and valid Australian rider or driver’s license. A winner must provide all information and sign all documentation necessary to enable the Promoter (or its nominated dealer) to register a vehicle in a winner's name prior to the prize winner’s collection of a vehicle from the relevant dealership. All costs associated with the registration, insurance, on road costs, stamp duty, dealer delivery costs, operational costs and travel to and from the dealership is at a winner’s own cost. The Promoter accepts no responsibility for any mechanical, body or paint repairs or repairs or maintenance of any kind relating to the prize after the date and time of prize collection by a winner. Any vehicles depicted in any promotional material are not necessarily the same colour or grade as a prize vehicle, and are for illustration purposes only. The Major Prize winner will be contacted by the Promoter to arrange for collection of the motor bike or vehicle (if applicable) from the dealership nearest to their usual residential address, as nominated by the Promoter in its sole discretion. Upon collection of a vehicle (as applicable), a winner must provide their current driver’s licence and arrange the required registration and compulsory insurance in their name, before a vehicle may be taken or driven away from the collection point. Collection of a vehicle is subject to availability of the vehicle, but is anticipated to be within twenty-eight (28) days from the date a winner is notified that they have won. It is a condition of accepting and participating in a prize that a winner may be required to sign eligibility form(s), code(s) of conduct and/or legal release(s) (including prize acceptance release(s)) in a form determined by the Promoter in its absolute discretion. The Promoter reserves the right to request a winner produce (within the requested time) appropriate photo identification or other documentation (to the Promoter's satisfaction, at its sole discretion) in order to confirm the identity and age of the winner before issuing the prize. The Promoter may conduct a further Prize Winner Decision at 11:00am (AEDT) at the same place as the Prize Winner Decisions and the Major Prize Winner Decision, as is necessary, on 3/12/2019 in order to distribute any prize/s unclaimed by that date, subject to any written directions given under NSW legislation. All valid Entries received during the Promotional Period (excluding any winners) will be entered into the unclaimed Prize Winner Decision. In the event of any winner(s) in the unclaimed Prize Winner Decision, the winner(s) will be notified by telephone and in writing by email within two (2) days of the unclaimed Prize Winner Decision, and the winner(s) name will be published on the Promotional Website from 5/12/2019 and will remain on the Promotional Website for no less than twenty-eight (28) days. All reasonable steps to notify any winner of the results of the Prize Winner Decision will be taken by the Promoter. The Promoter’s decision is final and no correspondence will be entered into. Entrants can only enter in their own name. Entrants who provide incorrect, misleading or fraudulent information are ineligible to participate in the promotion and all entries of an Entrant who is deemed by the Promoter to have provided incorrect, misleading or fraudulent information may, at the discretion of the Promoter, be deemed invalid. The Promoter reserves the right to request the Entrant produce (within the requested time) appropriate photo identification or other documentation (to the Promoter’s satisfaction, at its sole discretion) in order to confirm the Entrant’s identity, age, residential address, eligibility to enter and claim a prize, and any information submitted by the Entrant in entering the promotion, before issuing a prize. If any documentation required by the Promoter is not received by the Promoter (or its nominated agent) or an Entrant or Entry has not been verified or validated to the Promoter’s (or its nominated agent’s) satisfaction, then all the entries of that Entrant may be ineligible and deemed invalid. The Promoter reserves the right to verify the validity of any and all Entries and to disqualify any Entrant for: (a) tampering with the entry process; (b) submitting an Entry which is not in accordance with these Conditions of Entry; or (c) engaging in any unlawful or other improper misconduct calculated to jeopardise the fair and proper conduct of the promotion. The Promoter's legal rights to recover damages or other compensation from such an offender are reserved. A prize will only be awarded following any winner validation and verification that the Promoter, or its nominated agents, requires in their sole absolute discretion. As a condition of entering this promotion, each Entrant consents to, the Promoter using the Entrant's name, likeness, image and/or voice (including photograph, film and/or recording of the same), and all words provided in the entry, in any media worldwide for an unlimited period of time without further notification, remuneration or compensation for the purpose of promoting, publicising or marketing the promotion (including any outcome), and/or promoting any products or services manufactured, distributed and/or supplied by the Promoter. The Entrant agrees that, the Entrant will participate in all reasonable promoted activities in relation to the promotion as requested by the Promoter and its agents and sign any additional documents reasonably required by the Promoter to give effect to this condition. If a prize or element of a prize becomes unavailable, for any reason beyond the Promoter’s reasonable control, then a comparable prize or prize element of equal or greater value will be awarded in lieu, subject to any written directions made under applicable NSW legislation. If the promotion is not capable of running as planned for any reason beyond the reasonable control of the Promoter, including because of war, terrorism, state of emergency or disaster (including natural disaster), infection by computer virus, bugs, tampering, unauthorised intervention, technical failures, directions of regulators or industry self-regulatory bodies or any which corrupt or affect the administration, security, fairness, integrity or proper conduct of this promotion, the Promoter reserves the right, in its sole discretion, to cancel, terminate, modify or suspend the promotion and/or if necessary to provide alternative prize(s) to the same value as the original prize(s), subject to any written directions made under applicable State or Territory legislation. The Promoter and its associated agencies and companies exclude all liability (including negligence) except for any liability that cannot be excluded by law (including any applicable consumer guarantee under the Australian Consumer Law), for any direct or indirect injury, loss and/or damage arising in any way out of the promotion. This includes, but is not limited to: (i) technical malfunctions, delays or failures, including those resulting from accessing any materials related to this promotion and any incorrect, inaccurate or incomplete information communicated in the course of, or in connection with, this promotion as a result of any technical malfunctions, delays or failures; (ii) theft, unauthorised access or third party interference; (iii) lost or damaged entries, prize claims or prize(s); and/or (iv) acceptance and/or use of any prize. Applicable manufacturers and/or distributors should be contacted in regards to all prize warranty claims (where applicable). The Promoter and its associated agencies and companies exclude all liability for any financial implications, including Tax, that arise from the promotion, including from the winning of a prize. Winners are encouraged to seek their own tax advice from a registered personal finance / tax professional before accepting a prize. All of the Promoter’s decisions in respect of the promotion are final and no correspondence will be entered into. The Promoter collects Personal Information about an Entrant to include the Entrant in the promotion, decide on the awarding of the prizes (where appropriate) and use the information to assist in improving and promoting the goods and services of the Promoter. If the Personal Information requested is not provided, the Entrant cannot participate in the promotion and is deemed ineligible. An Entrant also agrees that the Promoter may, in the event the Entrant is a winner, publish or cause to be published the Entrant winner’s name in any media, as required under the relevant NSW government legislation. By entering the promotion and opting-in in the manner required, Entrants acknowledge that a further primary purpose for collection of the Entrant’s Personal Information by the Promoter is to contact the Entrant in the future with information about the Promoter, including special offers, market research or to provide the Entrant with marketing materials via any medium including mail, telephone and commercial electronic messages (SMS (Short Message Service), MMS (Multimedia Message Service), IM (Instant Messaging) and email) or any other form of electronic, emerging, digital or conventional communications channel whether existing now or in the future. The Promoter may share an Entrant’s Personal Information with its servants, employees, agents and trusted third parties who may contact the Entrant for their legitimate commercial purposes, including special offers, market research or to provide the Entrant with marketing materials in this way. By entering the promotion and opting-in, Entrants acknowledge and agree that the Promoter and any applicable third parties may use their Personal Information in the manner set out in this condition. In these Conditions of Entry: “Australian Consumer Law” means Schedule 2 of the Competition and Consumer Act 2010 (Cth). “Personal Information” means, for the purpose of the Privacy Act 1988 (Cth), information or an opinion about an identified individual, or an individual who is reasonably identifiable, whether the information or opinion is true or not and whether the information or opinion is recorded in a material form or not. Promoter: 1 Roofing & Building Supplies (ABN 54 102 699 972) of 1 Warraba Rd, North Narrabeen 2101; telephone: (02) 9970 8359.